In the 90s, with projects and labels such as Basic Channel, Maurizio or Main Street Records, the Berlin based producer team Mark Ernestus and Moritz von Oswald have decisively influenced the development of techno-house and electronic music worldwide. Furthermore Ernestus and von Oswald have released pioneering hybrids of reggae, dub and electronica under the name Rhythm & Sound since 1996. In the last few years an utterly original and independent definition of reggae music - stripped down, rootsy, hi-tech - has emerged from their activities. For their last album Rhythm & Sound w/ the artists Ernestus and von Oswald collaborated with legendary reggae vocalists, like Cornel Campbell, Jennifer Lara, Love Joy or The Chosen Brothers (aka Lloyd "Bullwackie" Barnes). This line is being pursued consequently with their new CD/LP release See Mi Yah. 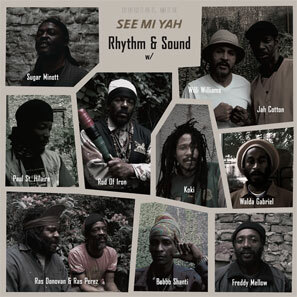 See Mi Yah is a classic one rhythm album, typical format and production approach in Reggae, featuring ten vocal versions and one instrumental of the See Mi Yah rhythm, that will have been pre-released as a series of seven 7-inch singles (additionally with 3 alternative instrumental versions) - strictly roots! After Paul St. Hilaire (formerly known as Tikiman) had lent his voice to quite a few Rhythm & Sound releases over the past years, the starting point for this project was to try and work also with his brother Ras Perez, their fellow Berlin based Dominicans Koki and Ras Donovan (also known from his collaboration with Mapstation), the Berlin based Jamaicans Freddy Mellow, Walda Gabriel, Bobbo Shanti, Lance Clarke as Rod Of Iron and Joseph Cotton aka Jah Walton as Jah Cotton as singers b/w DJs. With a toasting style heavily influenced by the legendary U-Roy, Cotton was a central figure in the jamaican DJ scene of the 70s and 80s. Alongside Ranking Joe and U-Brown he performed with the Blood & Fire Sound System a few years ago. On visit in Berlin, the great Sugar Minott and Willi Williams (famous for Studio 1 classic Armagideon Time) did their versions in the Rhythm & Sound studio. For each tune the rhythm is arranged and mixed differently. On the album the tracks are lined up in a way that allows the listener to enjoy See Mi Yah as one continuous program running for about 46 minutes. It's never a bore - and goes on in the listener's head, when voices, rhythm and sound will be long gone.